Food storage can be a bit of a struggle when you have more than one dog in the house, or just one big dog. I looked around for a cool project that would help me with my storage issue and came across this very cool and pretty easy DIY project. 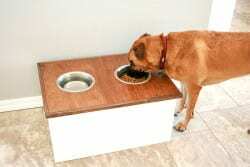 It keeps water and food dishes from being tossed around, and you can store a whole bag of dog food in it. It was built to fit a 10 gallon storage tub underneath the feeding bowls and the look is perfect for my home decor. Also, with larger dogs, they don’t have to bend over as much to feed and that’s plus when you have a larger dog like mine at home.